Meet the staff! These Godly people are as much family as staff. Most are residents at the Mission compound. They are the kind and good people who make your stay comfortable and memorable. DR. DENIS KALBERMATTER is a dentist and a registered nurse. He is the resident Clinical Director and Manager of MNC. Dr. Denis is married to ORNELLA KALBERMATTER, who oversees staff at the Mission. Dr. Denis and Ornella, along with their children, Oliver and Danna, are wonderful onsite hosts to our visiting volunteers. DR. ANIBAL OSCAR KALBERMATTER is a general physician and orthopedic surgeon. He is the overseeing Medical Director and Manager of MNC. Married to nurse ADRIANA “NANI” TORREBLANCA KALBERMATTER since 1981, the Kalbermatters have served in the past in Argentina, Paraguay and Madagascar. They have been a part of the Mission at Natuvu Creek since 2008. PETERO “SIWA” SIWATIBAU is integral to the mission. He is a medical assistant, chaplain, and activity coordinator for visiting teams. 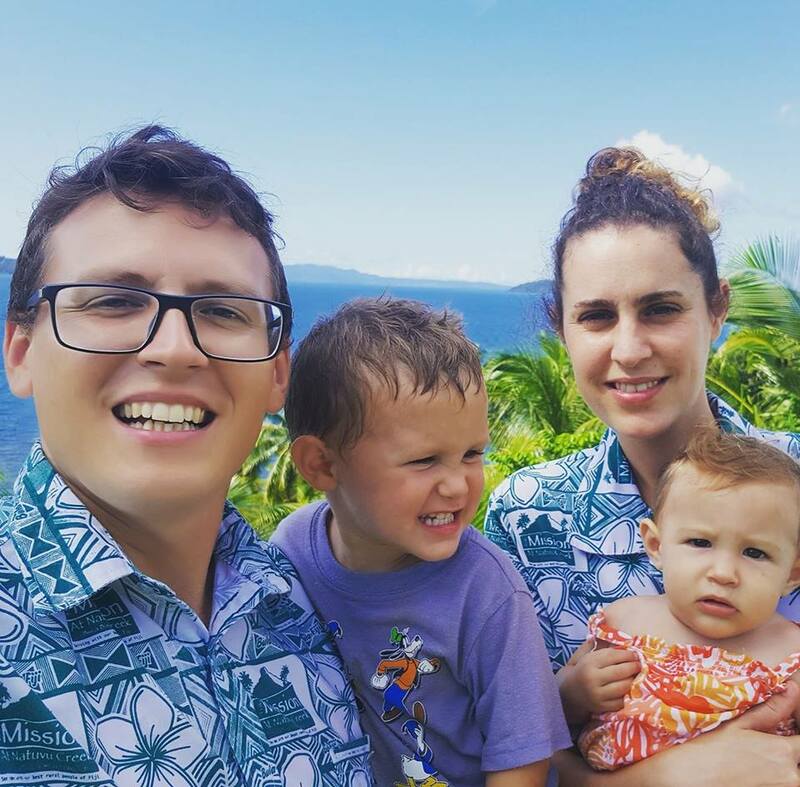 Married to Vika Vakaotia, Siwa has been with the Mission from the beginning, helping founders Tom & Marta Tooma when they were coming to serve at Buca Bay with the Dream Machine Foundation. Since then, he has been ever faithful to their friendship and the values and goals of the Misison. Siwa and Vika have four children, with the baby, Ulamila, sill with them at home. ANI TAINA keeps everything clean! Talented and honest, she leads the Housekeeping, Laundry and Clinic cleaning teams. But she also is skilled as a good dental assistant to our dental groups! Ani knows the dental area equipment, instruments and sterilization. 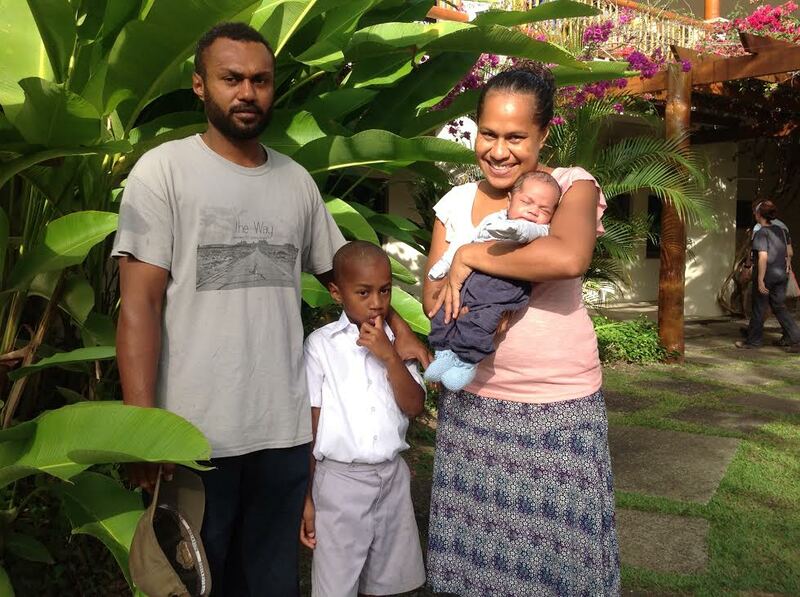 She is a lovely mother of four children, Apiliasi Tomu Kasa, Amelia Vakadranu, Iniasi Vodo and Filikesa Rakabikabi. Very soon we will have a wedding at MNC, as Ani is engaged to fiance Antonio! VIKA SAVU is our Special Cook. Blessed with a talent to cook for many, chef VIKA cooks delicious food at every meal for guests. Vika has four children (three adults and one in Middle School). 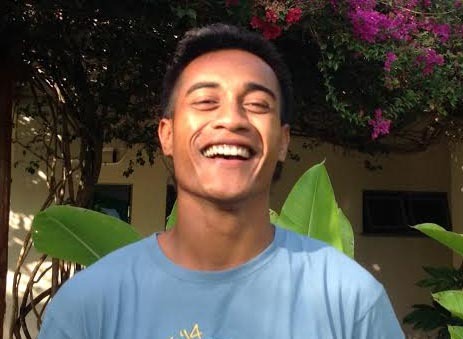 SEMI BOLENAIVALU leads the team of responsible for maintenance, joinery and arts. He is also a driver and purchaser for MNC. Shy and quie, Semi enjoys learning new jobs and taking on new challenges. We view him as a silent, yet wise man who works hard and has a great love for the Mission. 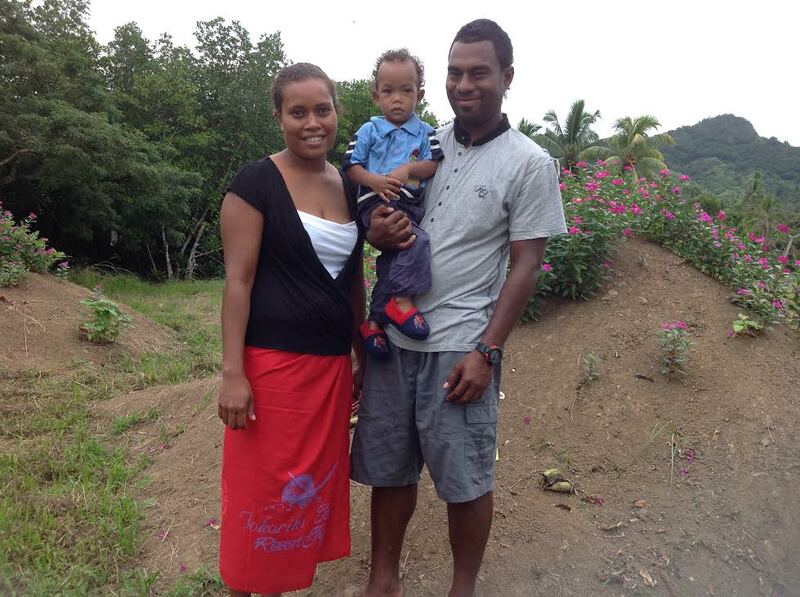 Semi is married to married with Mareta (Siwa’s daughter) and has one child, little Anibal. 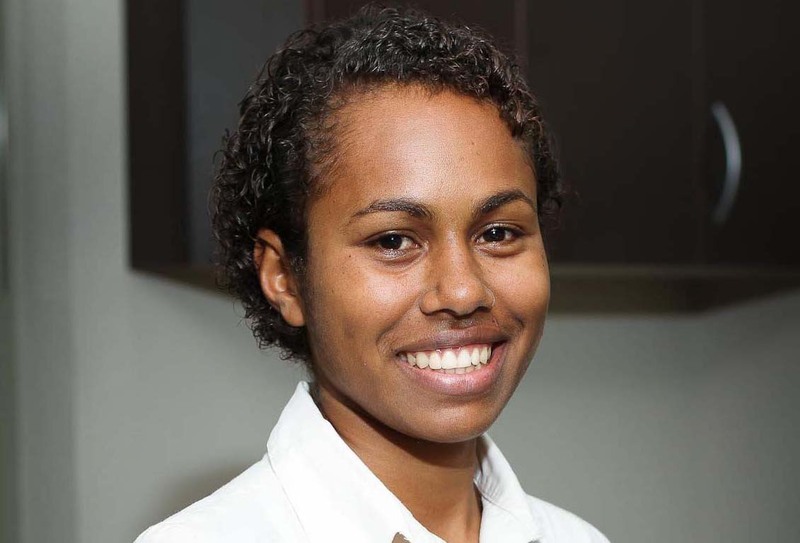 MARETA RASIWATIBAU is Semi’s wife and joined us in 2015 as a front desk receptionist. Mareta takes care of patient booking for Dr. Anibal and the visiting teams, as well as reports and statistics. 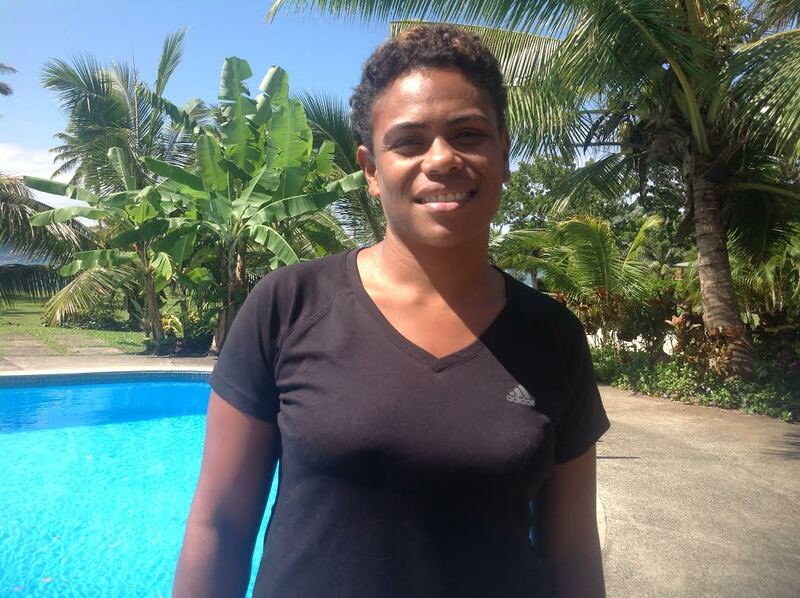 A young and loving mother and wife who volunteers for whatever is needed, we are so pleased to have Mareta with us. 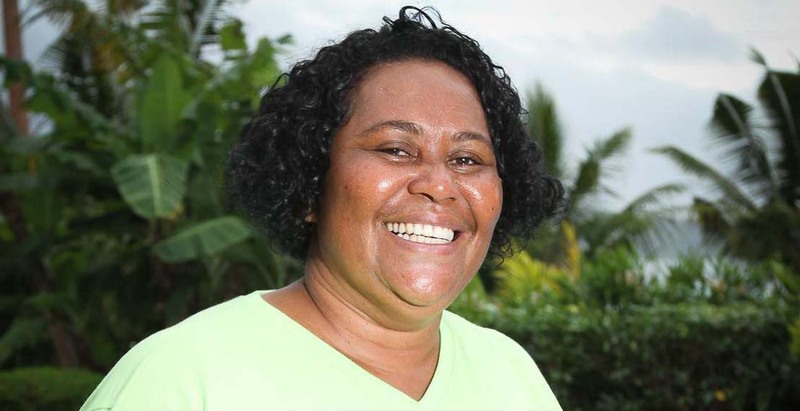 ISIKELI GAUNA is the Leader of the Landscaping and Groundskeeping team. He organizes MNC grounds projects, prioritizing cleanliness and the beauty of compound for visiting teams. He has built a team that is consistent and strong in the face of multiple challenges! 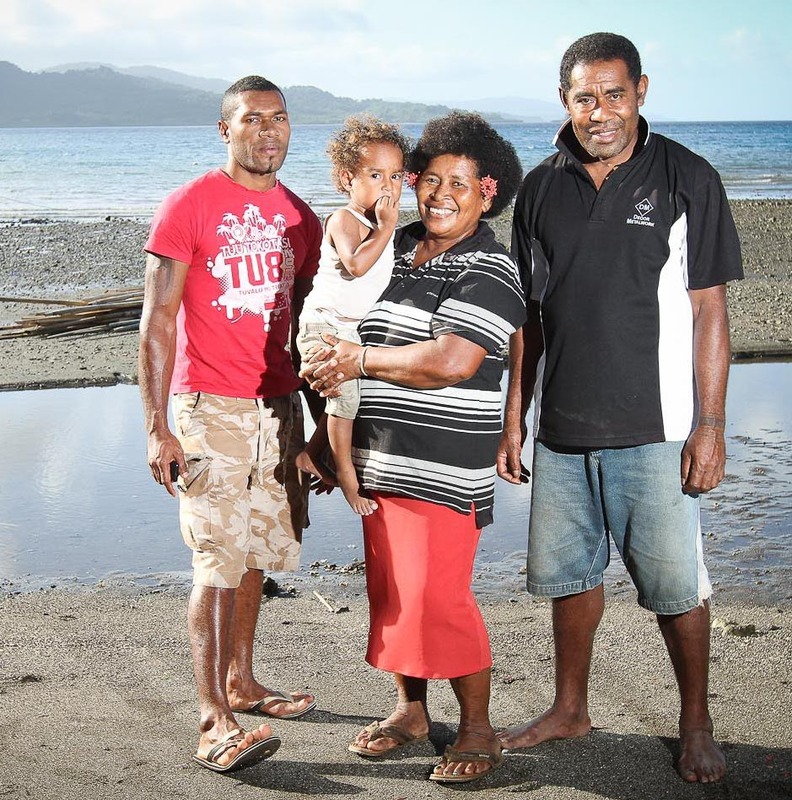 With wife, Suni, he has two daughters (one is a Nurse working in Suva), one son and one very loved granddaughter.They live in Buca village across the Bay. RAYAPE LOLOLOKO is our MNC Canteen Manager. Always smiling, she is a tireless and fast worker that takes good care of people needing supplies. 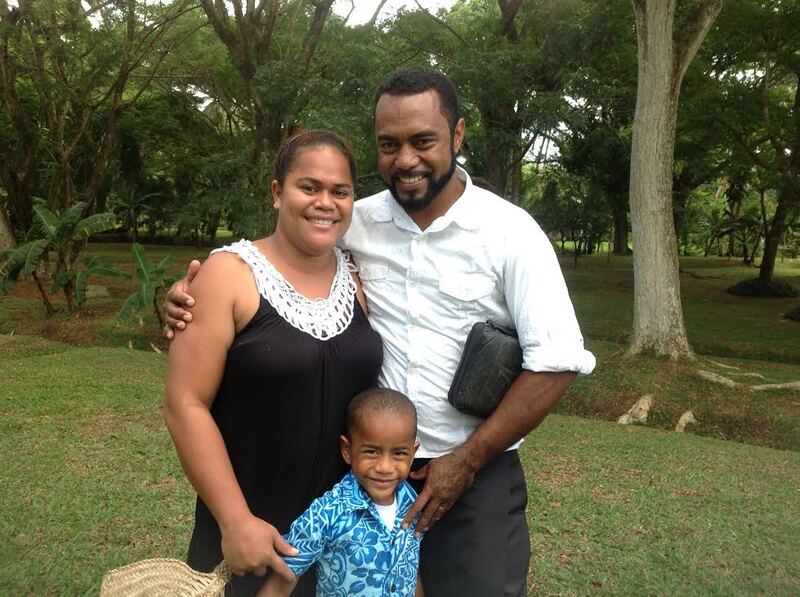 Rayape is married to JESE VAKAOTIA, a temporary worker at the mission who assists with carpentry and joinery. 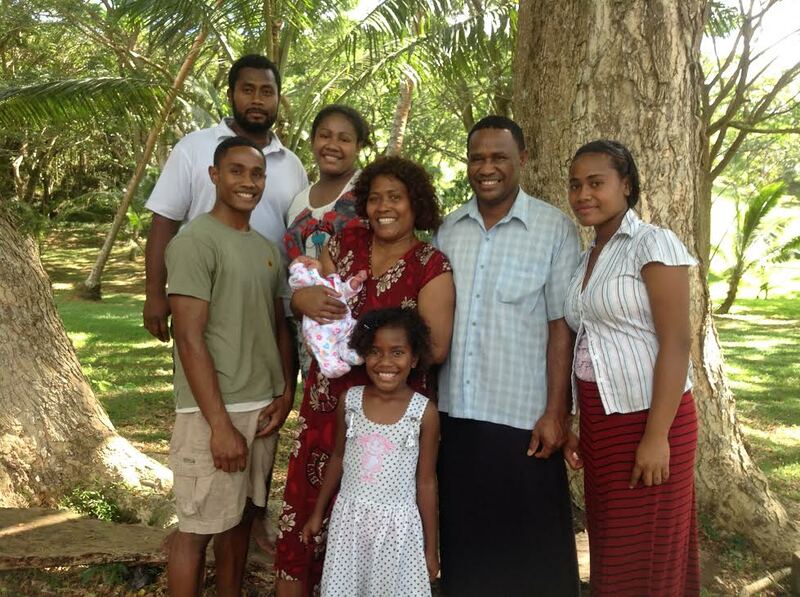 Rayape and Jese have three children (Unaisa, Tolota, Lyn) and two grand daughters from Unaisa, (Litiana and Vika). ISMELI WAINIQOLO is our “multitask man”. He is in charge of the 20 boxes of bee hives that supplies our delicious organic honey. Ismeli also looks after the saw mill and mahogany plantation. Most of the timber that the Mission needs is cut by Ismeli at our Saw Mill or by chainsaw. Ismeli also takes care of our water system, filters and tanks, to make sure we have enough, clean and safe water to use and drink. Mission Natuvu Creek water is as pure as any bottled water! Ismeli is married to Maria, who looks after son, Mitieli, and also a grandson. His kind smile, humble heart, and willingness to help are appreciated by all. MAIKELI LIVANI is our electrician, but loves to cook and help in the Kitchen in the afternoons. Maikeli is very patient and talented. His electrical skills have been a blessing for the Mission for his patient work with delicate medical equipment. 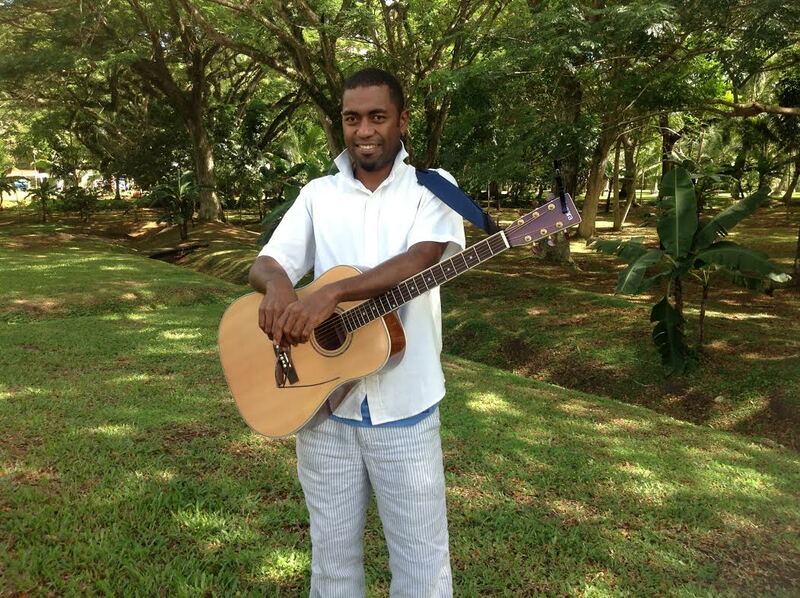 An excellent musician, he often plays the guitar for us. Maikeli is single, but has dreams of someday having a wife and children! WANA is a taylor and special workerfor the Mission, especially when visitors are here. She sews dresses for the staff, scrubs for the clinic workers, and often souvenirs for visitors. Wana is from Rabi Island across the sea, and is married with a teenager girl who wants to become a doctor. Wana is working hard to achieve that aim. A very spiritual lady and wonderful singer, Wana participates in our spiritual devotions. SIRINO DAKAI is a groundskeeper and mariner (he soon will receive his Capitan’s License!) A shy and silent man with a sweet heart, Sirino is a good fishermen and loves plants. He helps wherever necessary. 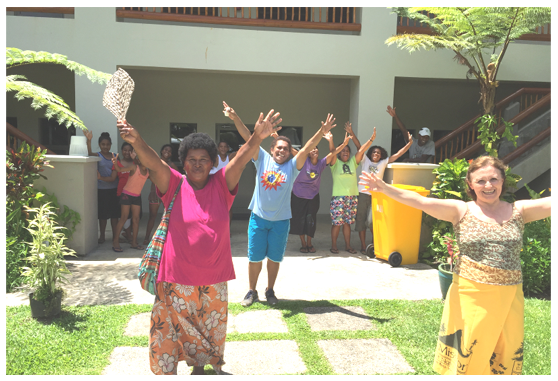 Sirino always has a big smile, especially when wife, Sisi dances the tradinional Fijian Meke dance for our visitors! Sirino and Sisi have two children, Enerico and Valeria, and two grandchildren, Small Sirino ( Kano) and Valencia. SISILIA “SISI” SENIASI is the second helper in the kitchen, with emphasis in cleaning and table setting. You will enjoy her delicious lemonades! Her cheerful spirit is contagious. Married to Sirino, she has four children (two adults, one in boarding High School, including Valeria) and looks after her two grandchildren. RACHEL “RAIJELI” TALATOKA is our O.R. assistant and scrub nurse. She is very bright, with a practical mind the ability to solve problems anytime. 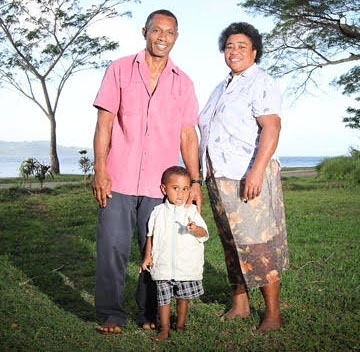 Married to Usaia Drigita Rokoiri, Raijeli is the mother of Timoci Sukabula Rokoiri and newborn Sakaraia Vuli. KAROLINA LAVEKAU is the only woman on our Landscaping and Grounds team. She cares for the flowers, making the face of the Mission look beautiful and clean. Karolina was one of the first workers at the mission, “defeating” the jungle landscape to help turn the Mission grounds into a paradise! She is married to Seru. They have six children, most of them younger adults. Karolina also looks after one of her six grandchildren. RUSIATE “RUSI” RATU is from nearby Loa Village. Fairly new to the team, he is a strong and hard worker (and a little shy!). 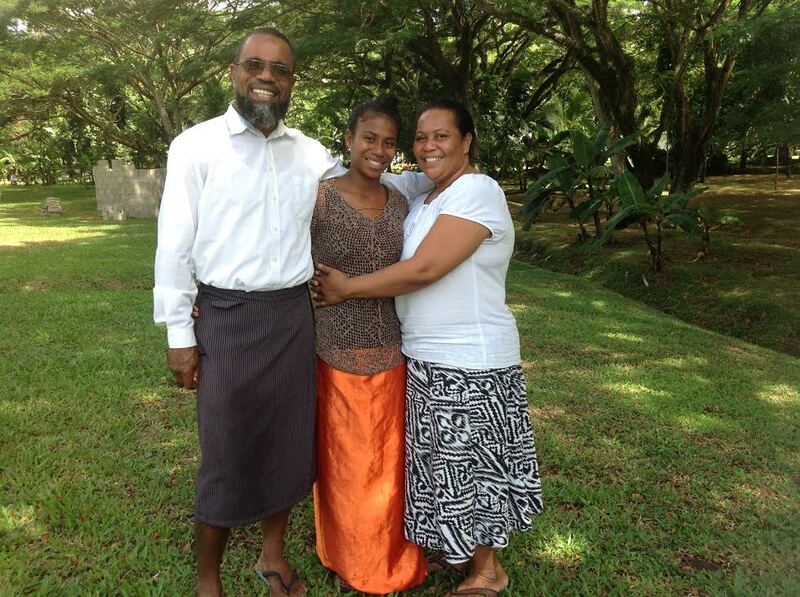 Rusi is married to Ema and has two children. We are so happy to have this kind man with such a good heart on our team. 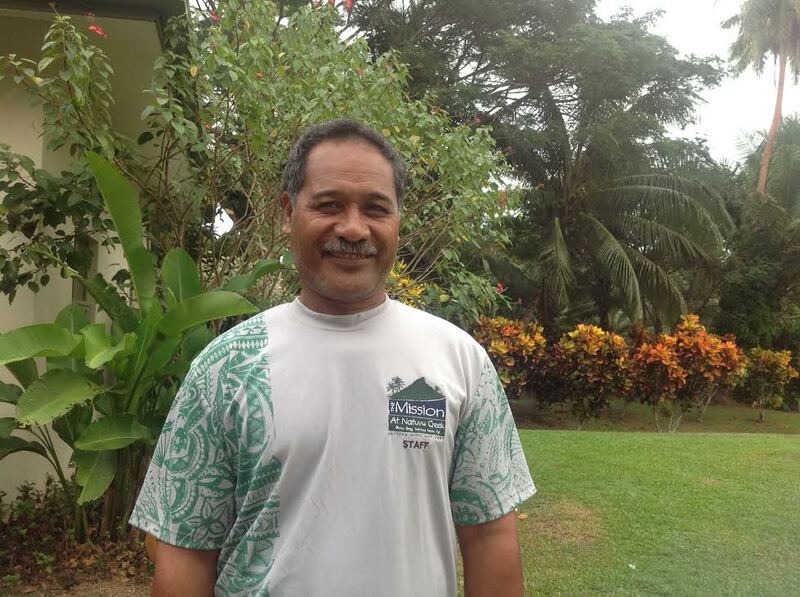 PESE MALAKAI is one of our grounds workers. He lives in Kioa Island, the closest Island to the Mission. 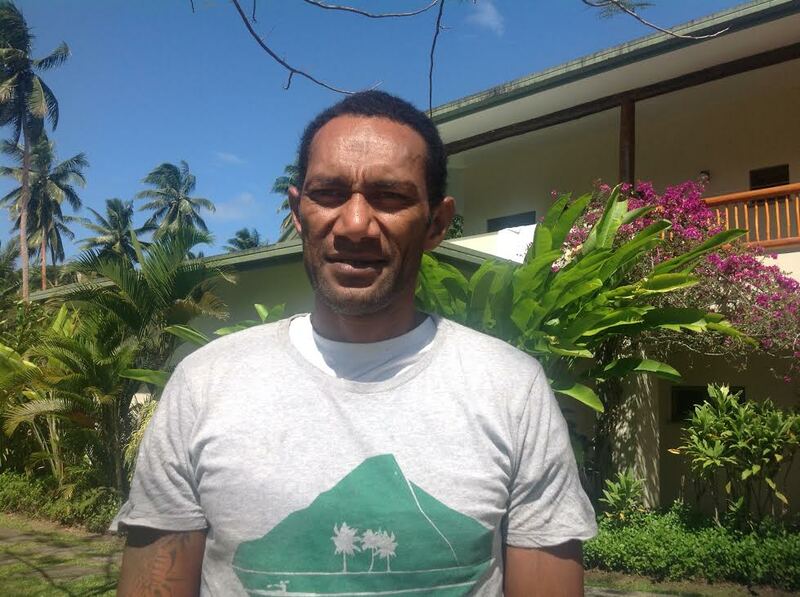 Pese paddles three hours in his small canoe to come to work every Monday, returning home on Fridays. It is a beautiful thing to see him peddling his canoe into the sunset on Friday evenings! 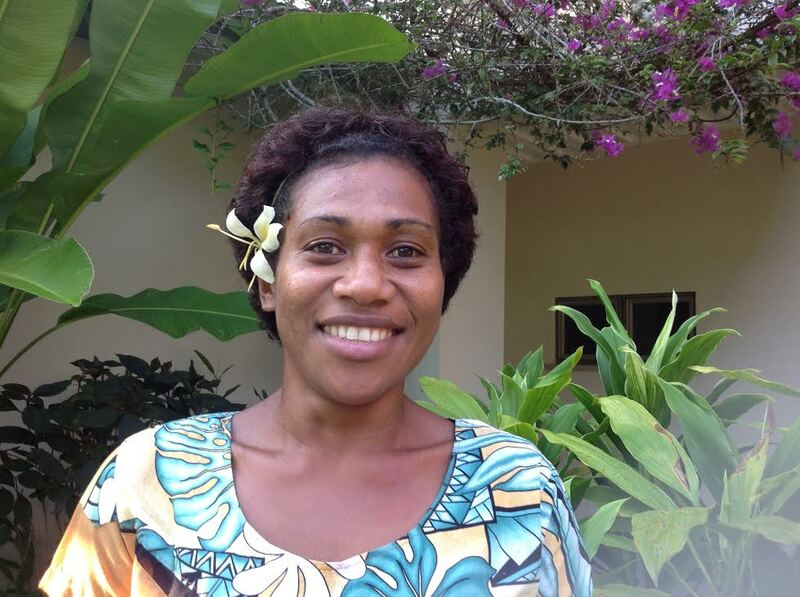 Pese has worked for MNC since 2007, helping to plant the beautiful variety of flowers and coconuts. He has a Godly heart and is raising a beautiful Christian family of 7 children with wife, Tarawa, a devout christian woman who encourages and supports him in educating and raising their children in the faith. 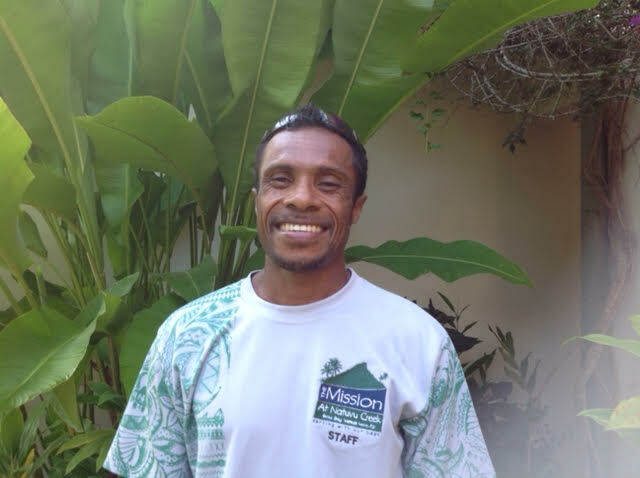 ERONI PAITALA VAKAOTIA is one of the Mission grounds workers. With his skill in farming and gardening, he is a valuable asset to the mission. Being light and able to climb, he can easily get to the roof or fit in small places that needs to be repaired! A very kind man and hard worker, he is married to Kusitina, a very sweet woman. 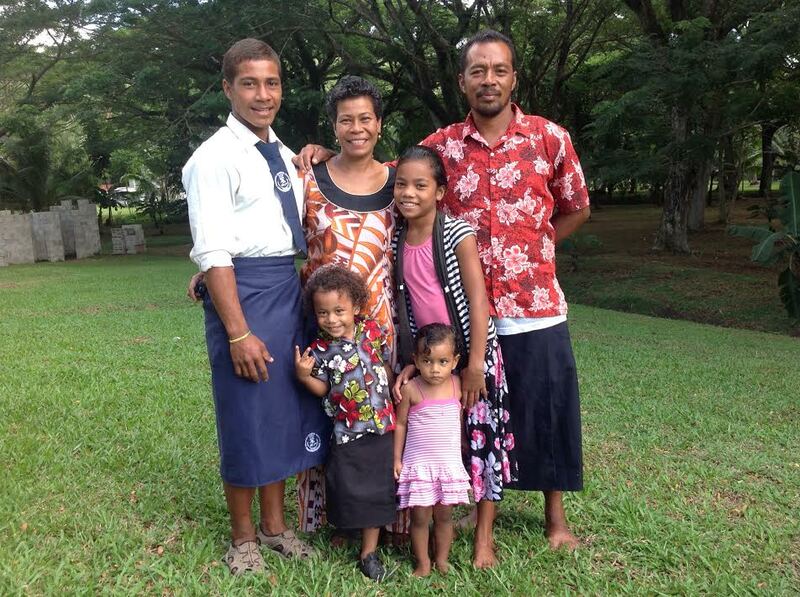 Eroni and Kusitina have two children, a boy named Halalimo and a daughter named Sera. Eroni also takes care of his mother. KINIASI BETA ROKO is one of the talented people who builds and maintains the Mission, whether it be painting or repairing, working in wood or cement. Kiniasi also has a talent for spear-fishing and diving and is available to take visitors on fun fishing and diving excursions. As our musical director, he is an amazing pianist with whom we enjoy singing and worshiping God. 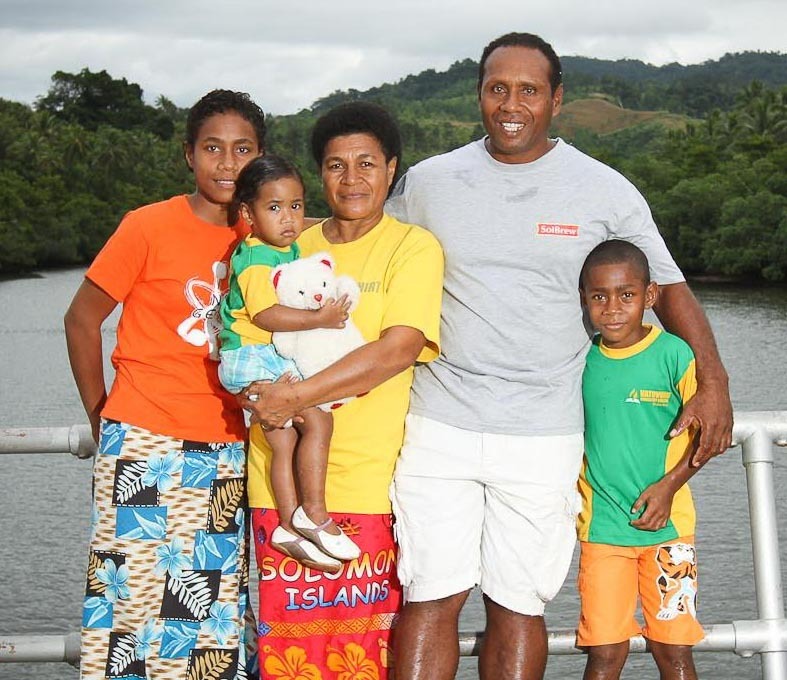 With his wife, Wati, he has four children, two girls, Peniana Ella, who is in Superior studies, and Viribale, in High School, both in the main Island. 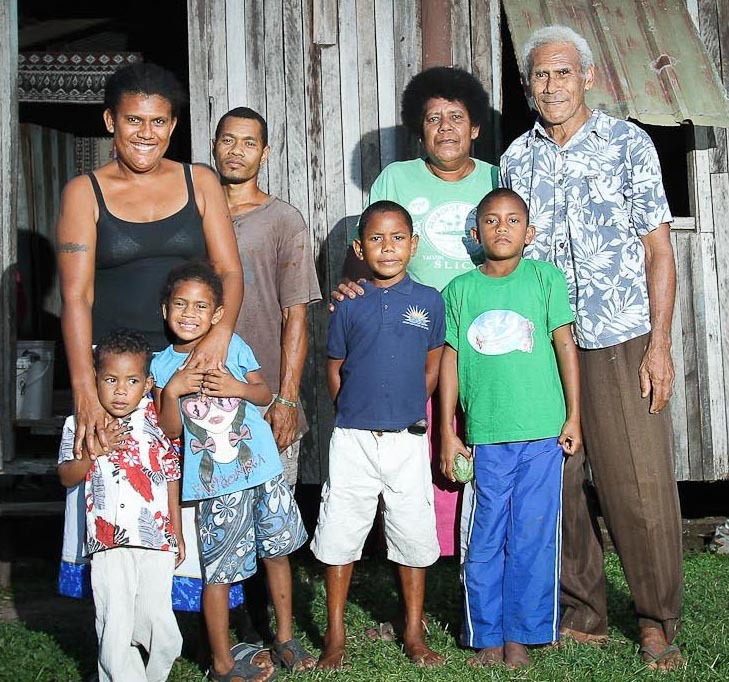 Two boys, Jesoni in Primary School and the small Tubuli, still live at home. SERA ANA is a part time worker, assisting in Housekeeping. Hard working, she is a mother of five children. Sera is from Navonu, a three hour walk away, where her husband Benjamin is a farmer. A dedicated Christian mother, Sera moved to the Mission to have their children close to a Christian Education School. VANI MARAMA is a part time worker. Currently assisting in housekeeping, she was our receptionist before moving away for an education. 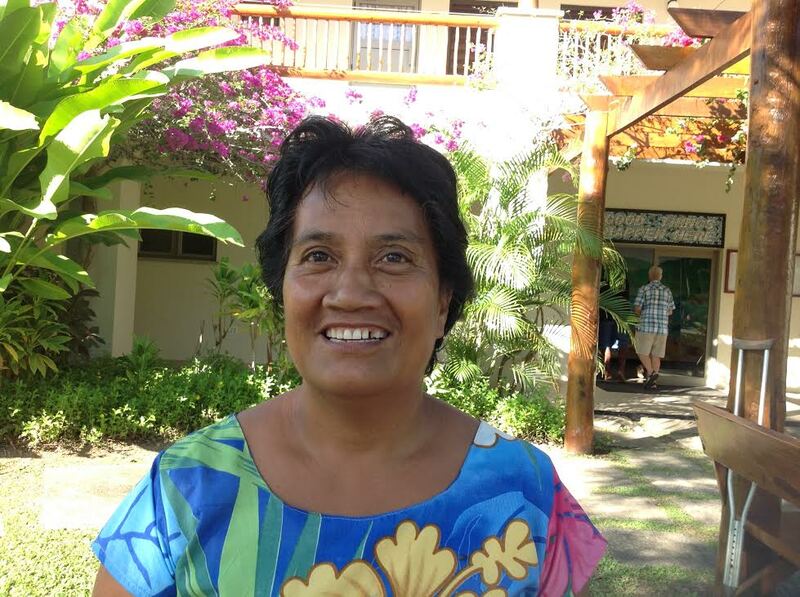 Vani became a Primary Level Teacher but loves to serve at the Mission and has returned. She is a single mother of one child and is very god at managing her time and duties. From Navonu Village, Vani walks three hours every day to come to work. 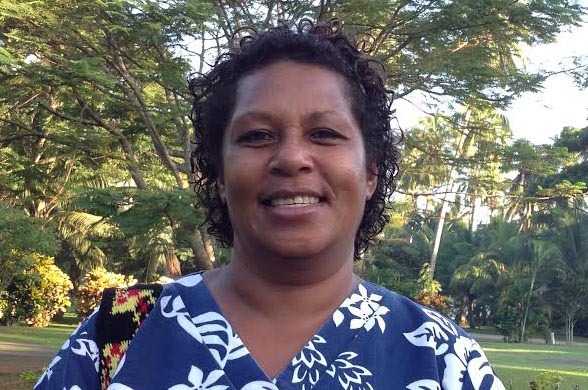 IRENE DELA is a part time worker, helping in the Surgery Room and assisting with sterilization and clean-up of surgery rooms and the general clinic. A very delicate woman, Irene has a sensitive heart. Her sense of cleanliness and order are well admired. She is from Gamea Island and is married, living in Buca Village with Mesake. They have a young adult daughter, also named Irene. MARAIA RAKULA is a cook’s helper, hard worker and sweet mother of 4 children. She is learning impressive cooking skills under Vika’s direction. Her children are Tiko, Jeremaia, Rosalia and Barbara Yalimiwai. KALEPOU JUSTIN PESE is the youngest worker we have. A single young man, he is a hard worker and follows in his father’s footprints. Kalepous helps takes care of his siblings. He is an appreciated member of the Activities Team, helping the visiting teams with group hikes, kayaking and other sports activities.